The Mediterranean Cruise Team Building activity is ideal for cocktails or for a networking event. 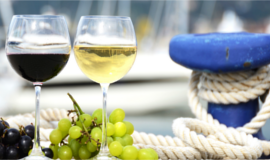 You are invited aboard a Mediterranean cruise to discover European wines. During this themed cocktail or evening, you will taste European wines. Visit four to five countries, discover their wines and taste wonderful cheeses that make for a perfect pairing. The culinary team building is a must for a gathering experience. Thanks to the theme, we transport the participants on a magnificent journey to enhance their discovery of wines. The Mediterranean cruise is an ideal concept for cocktails, congresses and networking events. Use this type of activity to get to know each other, to strengthen the ties between the members of your team but also to thank your employees, your clients or your partners. A friendly and festive experience!